Women's DFB-Pokal Round of 16 draw conducted at Deutsches Fußballmuseum! Home / German Football / General / Women’s DFB-Pokal Round of 16 draw conducted at Deutsches Fußballmuseum! Women’s DFB-Pokal Round of 16 draw conducted at Deutsches Fußballmuseum! 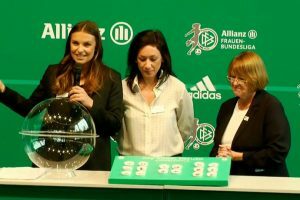 The draw ceremony for the German Women’s Cup (DFB-Pokal der Frauen) Round of 16 took place at the sidelines of the Women’s Bundesliga (Allianz Frauen-Bundesliga) season launch at the Deutsches Fußballmuseum (German Football Museum) in Dortmund yesterday. The draw was carried out by former Germany Women’s international and current UEFA Head of Women’s Football Nadine Kessler and DFB (German FA) Vice-President Hannelore Ratzeburg, while German sports tv presenter Laura Wontorra led through the proceedings. Defending Women’s DFB-Pokal champions VfL Wolfsburg travel to 3rd Division (Regionalliga) side FC Forstern, while last season’s losing finalists FC Bayern Munich host fellow Bundesliga side SV Werder Bremen. The Round of 16 matches will be played on November 17 and 18, while the final takes place at the RheinEnergieSTADION in Cologne on May 1, 2019. Previous XtraTime VIDEO: East Bengal to face Mohammedan Sporting in CFL! Next VIDEO: 2018/19 Indian Super League – #FanBannaPadega!